I used Brusho and an aquapainter to paint the ground and fire. I also had a piece of watercolor paper that I had used Brusho (Prussion Blue and Moss) to make a background. 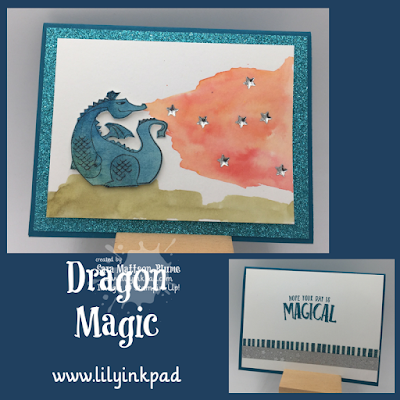 I stamped the dragon with Basic Black and then cut him out (forgetting I had a framelit to do the job). I made sure where I was going to place him and then added the fire and ground. For some fun, I added silver enamel stars. The Bermuda Bay Glimmer Paper made a great matte layer! Inside, I added two strips of Myths and Magic Washi Tape and the sentiment. I love this card.